About 160 people honored longtime Sauganash Community Church Troop 834 Scoutmaster Bob Waddick, whose family has three generations of Eagle Scouts, at a ceremony on Aug. 19 at the Copernicus Center Annex, 5214 W. Lawrence Ave.
Waddick led Troop 834 for 44 years, which recently merged with the Edgebrook Lutheran Church Troop 957. During that time, 84 members of Troop 834 achieved the status of Eagle Scout, the highest in the scouting program, including Waddick’s sons Brian, Dave and Rob, and Brian’s sons Joe and Sam. "As a result, for the last 13 years I have been one of the many assistant Scoutmasters in troop, where I have watched my sons go through the ranks, take the same scout adventures I did, and get Eagle, which was a highlight of my life. It has been an honor and privilege to be able to do just a fraction of what my dad has done in scouting," Brian Waddick said at the ceremony. In addition to the Waddick’s, a second local family, the Elliott’s, had five of its members achieve the rank of Eagle through Troop 834. 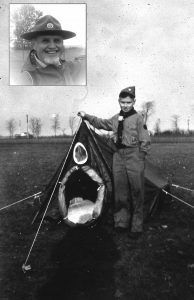 The 85-year-old Waddick has been active in scouting since 1945, when he joined Boy Scout Troop 50. He achieved the rank of Eagle in 1950, and in 1965 he became the Cubmaster of Cub Pack 3834, which he ran for 9 years. He became Scoutmaster of Troop 834 in 1974.In 2010 he was selected for recognition in the Boy Scouts of America National Hall of Leadership. During the Aug. 19 ceremony Waddick was honored with a proclamation from Governor Bruce Rauner declaring Aug. 19 "Bob Waddick Day" and a specialty portrait was created by local artist and musician John Langford, whose son is a also a troop member. The ceremony was organized by Eagle Scouts Andy Yassan, Paul Hunsicker, David Zulkey and Jesse Zien. 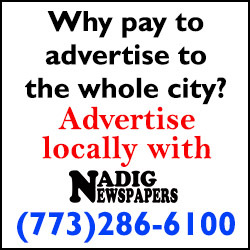 Assistant Scoutmaster John Harris assisted with contacting the governor’s office, while former member Gregg Kobelinski helped with the banquet arrangements, Brian Waddick said. While Waddick has retired as the troop’s Scoutmaster, he and Brian remain assistant Scoutmasters with Troop 957. "The troop had some challenges when the (Sauganash Community Church) sold the annex building across the street in 2014, but like good scouts we adapted, we persevered, and we kept (Troop) 834 going for as long as we could, but … it was time. "After a few years of deliberation and procrastination, at the end of 2017 with about 12 boys left, we made the decision to close up Troop 834, and merged our scouts and leaders with Troop 957 out of Edgebrook Lutheran Church. We chose them because we felt we could bring some good old leadership to what we saw was a troop with some brand-new leadership. And Bob could finally take a little rest after 44 years of running 834," Brian Waddick said.